Nurse Edith Cavell is a great choice for a Memorial Day movie. It tells the story of a different kind of war hero: An English nurse who helped prisoners of war return home during World War I. 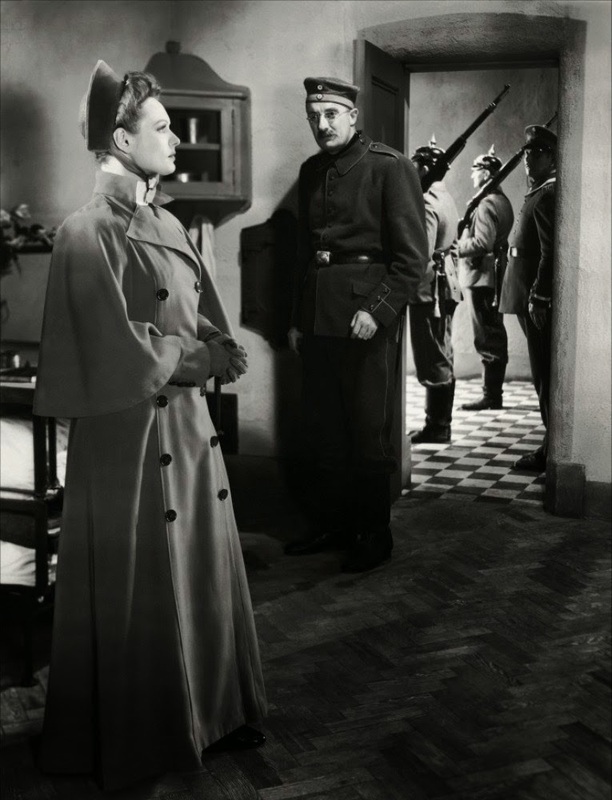 The photo above shows Cavell (Anna Neagle) being escorted from her prison cell by a German guard. Just a quick note: I did include spoilers in this article because the movie is based on real events that are widely known. The Stars: Anna Neagle, Edna May Oliver, and George Sanders. Source Material: Nurse Edith Cavell is a remake of director Herbert Wilcox's 1928 silent film, Dawn. A vintage poster for Nurse Edith Cavell. Awards: Composer Anthony Collins was nominated for an Oscar for Best Original Score. The Plot: English nurse Edith Cavell is the matron of a hospital in Brussels when the German army invades Belgium during World War I. Cavell helps the son (Jimmy Butler) of her former patient escape from the Germans. She and a group of women from all corners of society then begin to help wounded English, French, and Belgian soldiers escape. Cavell gets 210 men to safety before she is arrested and executed by the Germans for treason. Backstory: The real Cavell's trial and execution in 1915 were a media sensation. The execution by firing squad of a woman and a medical professional stirred outrage around the world and probably helped lead to the United States entry into World War I. In 1928, Wilcox made a highly controversial film about Cavell's story called Dawn. Ten years later the Nazi war machine was rampaging all over Europe, so Wilcox decided to revive Cavell's story for a new film featuring his wife, actress Anna Neagle. 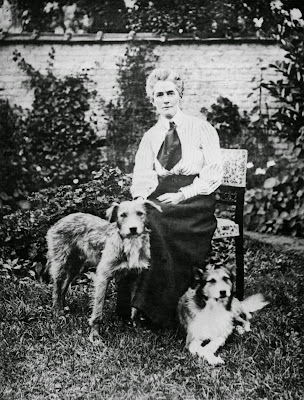 The real nurse Edith Cavell with her two dogs. Best Performance: Anna Neagle as Edith Cavell. 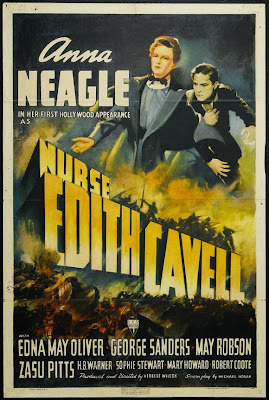 Nurse Edith Cavell features great supporting turns from Edna May Oliver, May Robson and ZaSu Pitts, but Neagle anchors the film with a quiet, but forceful performance as the title character. Neagle was the queen of the biopic in the 1930s -- she played Queen Victoria and royal mistress Nell Gwyn before coming to RKO in 1938 to make Nurse Edith Cavell. Best scene: The final scene is a fine tribute to the life of a brave woman (clip below). Best Line: "This I would say, standing as I do in view of God and eternity, I realize that patriotism is not enough. I must have no hatred or bitterness towards anyone," the real Edith Cavell said these words to an Anglican priest shortly before her death. They are repeated in the film. The Real Edith Cavell: Cavell was originally from Swardeston, England, but she was operating a teaching hospital for nurses in Brussels when the German army invaded Belgium. Two wounded British soldiers came to the hospital, and Cavell helped them escape to the Netherlands rather than turn them over to German authorities where they would either be placed in prisoner of war camps or be shot. This led Cavell, architect Philippe Baucq, and several members of the Belgian nobility to set up a series of safe houses where more than 200 soldiers and men of military age escaped before Cavell and the others were turned in by a French informant. 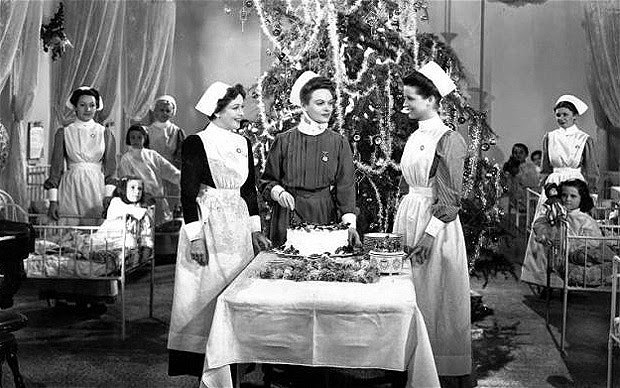 Edith Cavell (Anna Neagle, center) celebrates Christmas with the hospital staff and patients in Nurse Edith Cavell. Trial and Execution: Cavell and 27 others were arrested and tried for treason. Their actions were considered treason for two reasons. First, they aided enemy soldiers to escape so they could return to their homelands and fight against Germany. Second, they helped able-bodied Belgian and French men escape the country so they wouldn't be drafted in the German army. These actions were punishable by death under German law, but only Cavell and Baucq were actually executed. They were shot by the same firing squad in the early morning hours of Oct. 12, 1915. 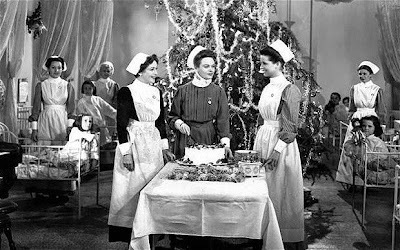 Fun Fact: Orson Welles used the score for Nurse Edith Cavell as the music in the newsreel footage that opens Citizen Kane (1941). 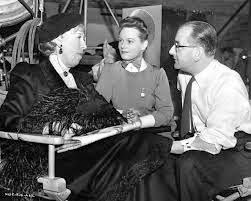 Edna May Oliver (left), Anna Neagle, and director Herbert Wilcox relax on the set of Nurse Edith Cavell. Why it's essential: Nurse Edith Cavell is an engrossing drama that honors the heroism of a brave woman who gave her life to help others. The movie is fast-paced and exciting and the final scene is a fine tribute to Cavell's memory. There are a few minor quibbles. Cavell's story was very well-known in the 1930s, so Wilcox does gloss over some information that can lead to confusion for modern audiences. Also, the print of Nurse Edith Cavell is in poor condition. It can be difficult to make out the action in the night scenes, and the sound can be garbled and scratchy. Availability: Nurse Edith Cavell is available for streaming on Amazon Prime. It is also available on video on demand. Next week, Gary Cooper, Ray Milland, and Robert Preston join the foreign legion in Beau Geste.